This is a quiz that contains NCLEX review questions for chronic kidney disease (also called end stage renal failure). As a nurse providing care to a patient with CKD, it is important to know the signs and symptoms, pathophysiology, nursing management, patient education, and treatment for this condition. Don’t forget to watch the chronic kidney disease lecture before taking the quiz. 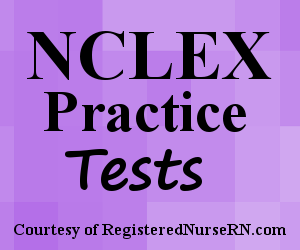 This quiz will test your knowledge on chronic kidney disease (end stage renal disease) in preparation for the NCLEX exam. A. A 58 year old female with uncontrolled hypertension. B. A 69 year old male with diabetes mellitus. C. A 45 year old female with polycystic ovarian disease. D. A 78 year old female with an intrarenal injury. A. "This medication will help keep my calcium level normal." B. "I will take this medication with meals or immediately after." C. "It is important I consume high amounts of oatmeal, poultry, fish, and dairy products while taking this medication." D. "This medication will help prevent my phosphate level from increasing." 1. A 55 year old male patient is diagnosed with chronic kidney disease. The patient’s recent GFR was 25 mL/min. What stage of chronic kidney disease is this known as? 2. A patient with CKD has a low erythropoietin (EPO) level. The patient is at risk for? The answer is B. EPO (erythropoietin) helps create red blood cells in the bone marrow. The kidneys produce EPO and when the kidneys are damaged in CKD they can decrease in the production of EPO. Therefore, the patient is at risk for anemia. 3. A 65 year old male patient has a glomerular filtration rate of 55 mL/min. The patient has a history of uncontrolled hypertension and coronary artery disease. You’re assessing the new medication orders received for this patient. Which medication ordered by the physician will help treat the patient’s hypertension along with providing a protective mechanism to the kidneys? The answer is A. There are two types of drugs that can be used to treat hypertension and protect the kidneys in patients with CKD. These drugs include angiotensin converting enzyme inhibitors (ACE inhibitors) and angiotensin receptor blockers (ARBs). The only drug listed here that is correct is Lisinopril. This drug is known as an ACE inhibitor. Metoprolol is a BETA BLOCKER. Amlodipine and Verapamil are calcium channel blockers. 4. Which patient below is NOT at risk for developing chronic kidney disease? The answer is C. Options A, B, and D are all at risk for developing CKD. However, option C is not at risk for CKD. 5. A patient with Stage 5 CKD is experiencing extreme pruritus and has several areas of crystallized white deposits on the skin. As the nurse, you know this is due to excessive amounts of what substance found in the blood? The answer is B. This patient is experiencing uremic frost that occurs in severe chronic kidney disease. This is due to high amounts of urea in the blood being secreted via the sweat glands onto the skin, which will appear as white deposits on the skin. The patient will experience itching with this. 6. Your patient with chronic kidney disease is scheduled for dialysis in the morning. While examining the patient’s telemetry strip, you note tall peaked T-waves. You notify the physician who orders a STAT basic metabolic panel (BMP). What result from the BMP confirms the EKG abnormality? The answer is D. The patient’s potassium level is extremely elevated. A normal potassium level is 3.5-5.1 mEq/L. This patient is experiencing hyperkalemia, which can cause tall peak T-waves. Remember in CKD (especially prior to dialysis), the patient will experience electrolyte imbalances, especially hyperkalemia. The answers are B and D. Calcium acetate (also known as PhosLo) is a phosphate binder, which will help keep the patient’s phosphate level from becoming too high. It helps excrete the phosphate taken in the food by excreting it out of the stool. Therefore, it should be taken with meals or immediately after. Option C is wrong because the patient should AVOID these types of foods high in phosphate. 8. While assessing morning labs on your patient with CKD. You note the patient’s phosphate level is 6.2 mg/dL. As the nurse, you expect to find the calcium level to be? The answer is B. A normal phosphate level is 2.7-4.5 mg/dL. This patient is experiencing HYPERphosphatemia. When hyperphosphatemia presents the calcium level DECREASES because phosphate and calcium bind to each. When there is too much phosphate in the blood it takes too much calcium with it and it decreases the calcium in the blood. Therefore, the nurse would expect to find the calcium level decreased. The answer is A. The patient should follow this type of diet because protein breaks down into urea (remember patient will have increased urea levels), low sodium to prevent fluid excess, low potassium to prevent hyperkalemia (remember glomerulus isn’t filtering out potassium/phosphate as it should), and low phosphate to prevent hyperphosphatemia. 10. The kidneys are responsible for performing all the following functions EXCEPT? The answer is D. The adrenal glands are responsible for maintaining cortisol production not the kidneys.